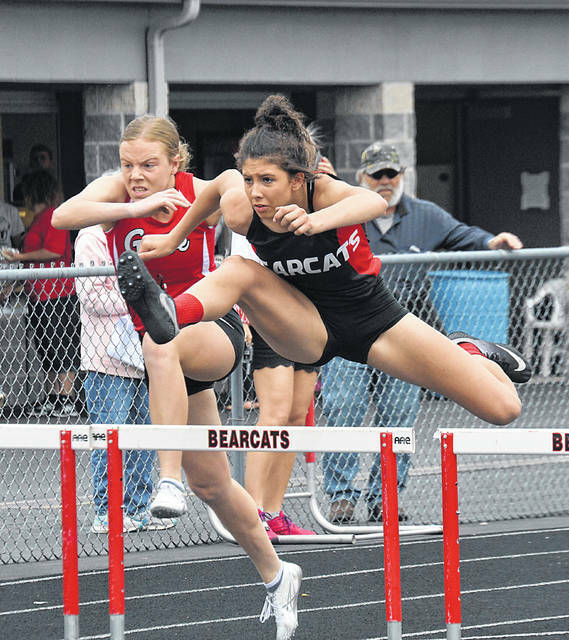 SPENCERVILLE — The Columbus Grove girls’ track-and-field team was celebrating moments after it closed out Saturday’s Northwest Conference Meet with a convincing win in the final event, the 1,600-meter relay. Columbus Grove scored an astonishing 202.5 points, to outdistance Spencerville for the team title, which scored 112.5 points. Lincolnview (90) finished third, while Bluffton (79.5) was fourth in the nine-team field. However, the Columbus Grove boys’ squad, which went into the 1,600 relay tied with Bluffton for the team lead, was forced to wait out a decision by the meet officials, following the 1,600 relay. In the final leg of the 1,600 relay, a Bluffton runner bumped into a Columbus Grove runner on one of the turns. The final decision came back as a disqualification on Bluffton, which gave Columbus Grove the team victory over Bluffton, 111-107. Lincolnview (106.5) finished a very close third, while Ada (96.5) rounded out the top four teams. Saturday marks Columbus Grove’s fifth consecutive NWC girls’ team title. For their male counterparts, it’s been two years since they’ve brought home the first-place conference trophy. “We knew it was going to be close,” Columbus Grove boys coach Chris Grothaus said. “We knew it could come right down to the end. We just didn’t figure it would end up quite like that. But give Bluffton credit. They were really good on the track. They lacked in a couple field events, but their kids ran like crazy. The Columbus Grove boys notched just one first-place finish in the two-day meet – Evan Hopkins’ win in the pole vault (11-feet). However, the Columbus Grove girls’ team scored points in droves. McCluer lost a close race in the 100 hurdles to Spencerville’s Nelaya Burden. Burden won in a track-record time of 14.87 seconds. McCluer finished second in 14.98. 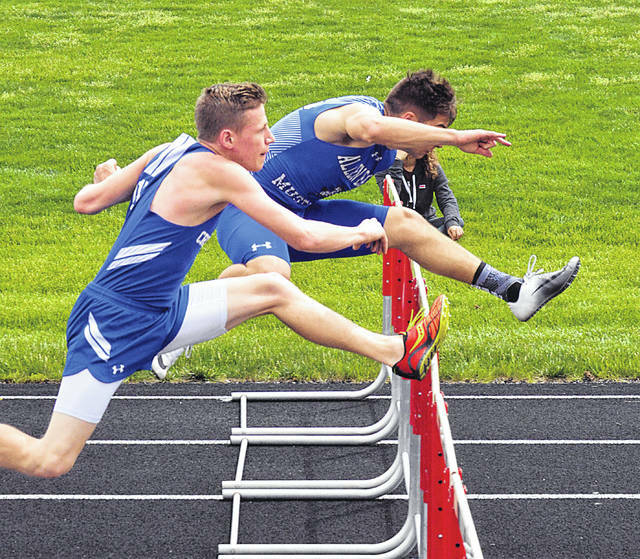 In the 300 hurdles, McCluer edged out Burden for the win. McCluer’s winning time of 45.83 in the 300 hurdles was an NWC record. Burden clocked 46.95 in the 300 hurdles. Both McCluer and Burden were state-placers last season. The Bulldogs also dominated the distance events. On Thursday, Columbus Grove won the 3,200-meter relay (Downing, Taylor Ellerbrock, Lauren Benroth and Alyssa Ellerbrock) with an impressive time of 9 minutes, 53.68 seconds. On Saturday, Columbus Grove took first and second in the 1,600, as Alyssa Ellerbrock won in 5:17.18 and Downing was second in 5:24.95. In the 800, Downing took first (2:27.15), while teammate Taylor Ellerbrock was second (2:30.14). In the 3,200, Alyssa Ellerbrock pulled away early from the pack for the win (11:43.87). Alyssa Ellerbrock said it was difficult to run the time she wanted in the 3,200, since there was nobody pushing her. Staley said his team’s lineup could look a little different when it competes at this week’s Division III district meet at Spencerville (Thursday and Saturday). The top four placers in each event at districts will advance to regionals. 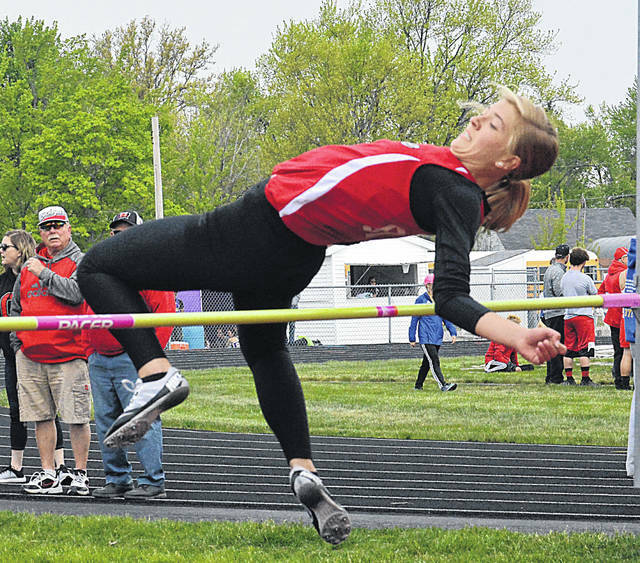 On Saturday, Spencerville senior pole vaulter Gabrielle Goecke struggled to get her opening height of 10-foot. However, once she cleared it on her third attempt, the three-time state-qualifier went on to win her event with a clearance of 10-6. She went on to attempt 11-foot, but failed to clear it in her three attempts. Goecke’s all-time personal best is 11-2. Goecke placed seventh at last year’s state meet. “I really want to get up on that podium at state, towards the top,” she said. Lincolnview junior Karter Tow won the 3,200 Saturday in a stellar time of 10:05.58. Earlier in Saturday’s meet, Tow finished third in the 1,600 (4:40.67). Teammate Alek Bowersock finished second in the 1,600, while Bluffton freshman Asher Antrim won in an impressive time of 4:38.59. This entry was tagged alleneast, Bluffton, columbusgrove, crestview, delphosjefferson, lincolnview, paulding, Spencerville. Bookmark the permalink.